When you put some things in your shopping cart at Stacksocial, you may be offered an option to purchase a $100 store credit for $80. That’s a 20% off discount. 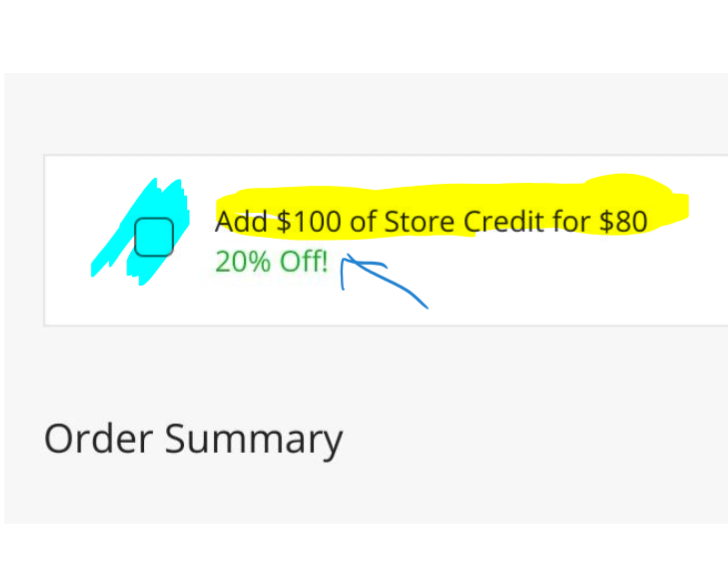 If you are a frequent Stacksocial shopper or if you are planning future big purchases, this is like getting a 20% off discount on everything you buy using the store credit. On the other hand, if you are not a frequent shopper or do not make big purchases there, maybe you don’t need it. If you are participating in the Plenti rewards program, check your email or their website or their app! A new promotion is rolling out that you must first activate before you can use. 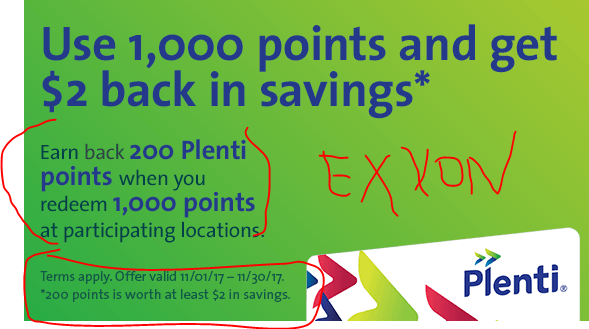 With this promotion, you get 200 bonus Plenti points if you redeem at least 1000 Plenti points at an Exxon-Mobil gas station. This is very easy to go, all you have to do is fill up at least $10 in gas, and you get a $2 equivalent as a bonus! 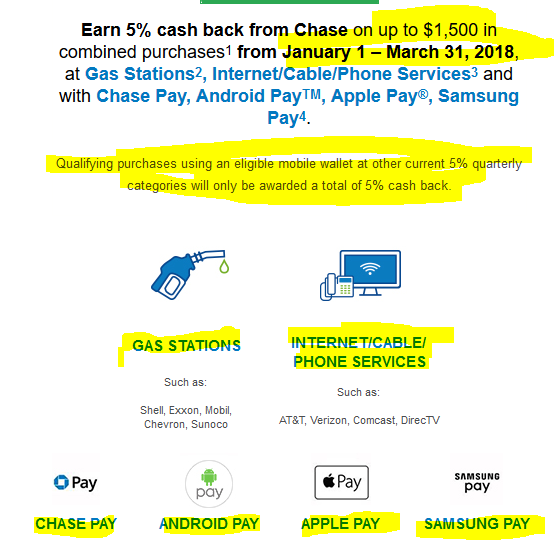 You will also earn the regular Plenti gas bonus. Promotion ends November 30 in 2017. If you are very close to this, you may want to drive around the block a couple of times. It is a good idea every time you refill your gas to reset your mileage counter and calculate your mileage. It’s a good way to monitor the health of your car. A sudden or unexplainable drop in mileage can be an early warning of bigger troubles ahead! If you are participating in the Bing Rewards program, they currently have a redemption discount limited-time promotion. 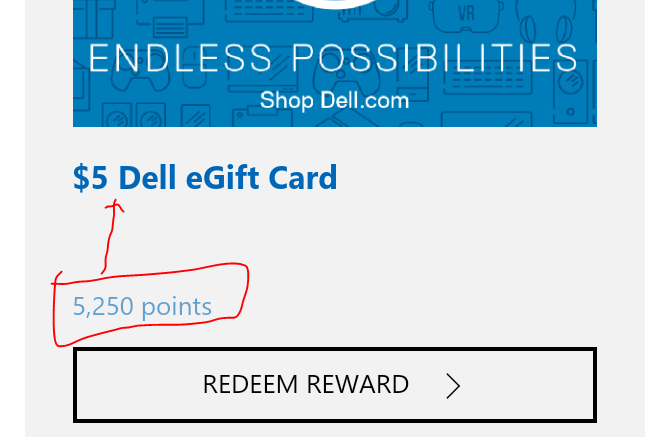 You use up 5250 of your points and for that you get a $5 Dell electronic gift certificate. 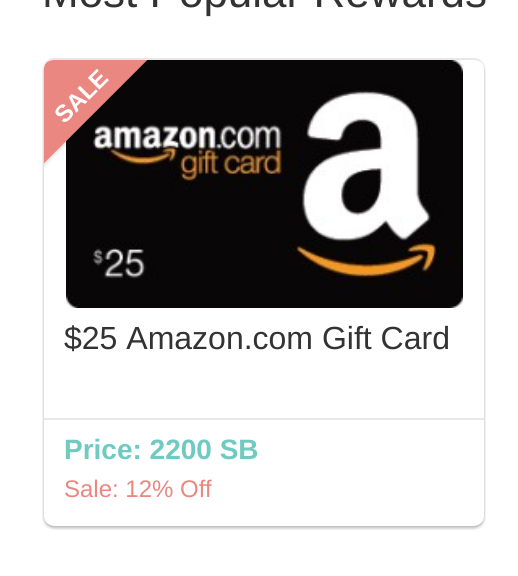 The typical redemption amount for $5 e-gift cards is 6250. The rest of the options are not currently discounted. AARP is on a recruiting drive. 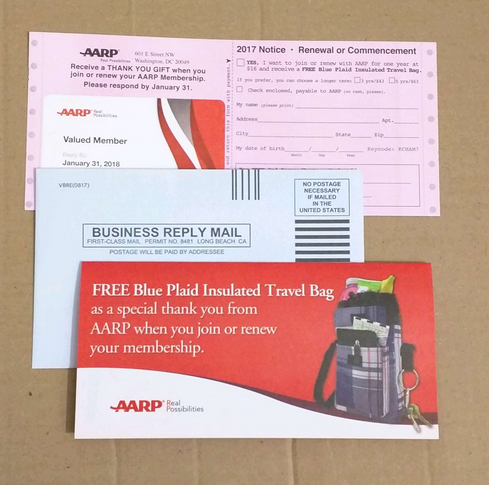 Before you recycle all the promotional material in this week’s circular ads in your mailbox, IF you are interested in signing up or renewing an AARP, membership, look for an envelope-style offer from them. Inside that you will find the offer: you pay $16 for one year and as a gift you receive a FREE blue plaid insulated travel bag. The promotion is good for both new members and renewals. It is stated clearly in the pink form! This promotion runs until January 31st in 2018. There is no mention of a brand name for the free travel bag. So nothing “tangible” like a stadium bag, but a solid round of options! T-Mobile Tuesdays are back with a good lot for September 26 in 2017! 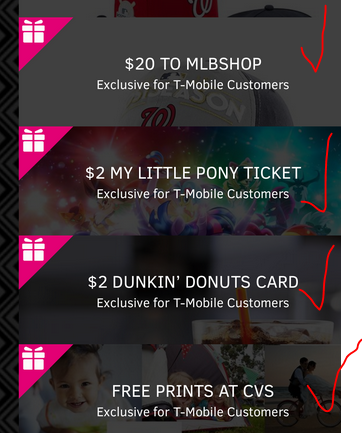 You get a clear T-Mobile branded stadium bag (you pick it up at the T-Mobile brick and mortar stores ~ if you are nice to their employees and they have too many of them, you may be able to score more of them), and a $2 Dunkin Donuts gift card (if you have Dunkin stores near you). 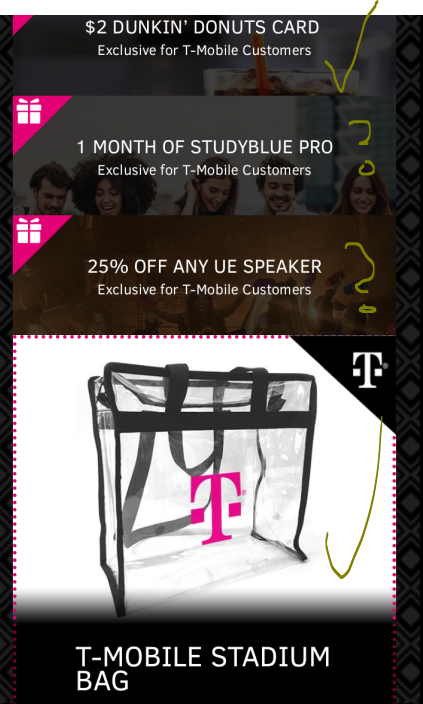 The other two offers are not as good, unless you need to buy a Ultimate Ears bluetooth speaker from the T-Mobile B&M stores (probably at full price): you get a 25% off discount. And last but not least, is a 1-month subscription to “StudyBlue PRO”, which I’m assuming is some kind of a service for college students. It’s a mixed bag as far as the September 5 (2017) T-Mobile Tuesdays are concerned. You get two media freebies and two coupons. The best freebie is a brand new arrival at Tuesdays, a free 4-week online course at Shaw Academy. The other freebie is a 1-day free rental at Redbox kiosks. That’s good! 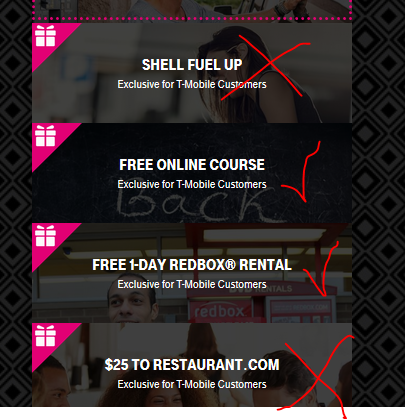 T-Mobile August 29 Tuesday FREEBIES are good! 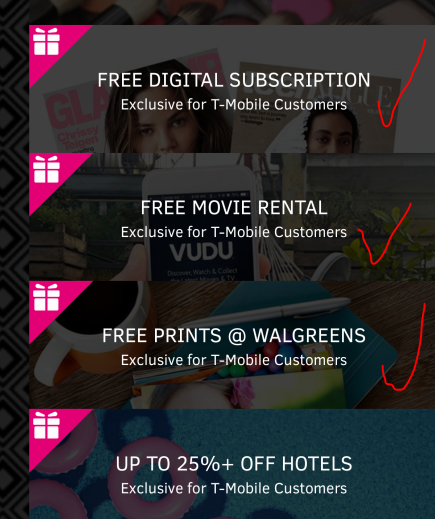 If you have multiple lines, you can get multiples of each promotion, however, some companies (eg Vudu) place weekly limits on how many freebies you can redeem per individual account. So you can only have one $5.50 credit per Vudu account per week, even if you have four T-Mobile lines. 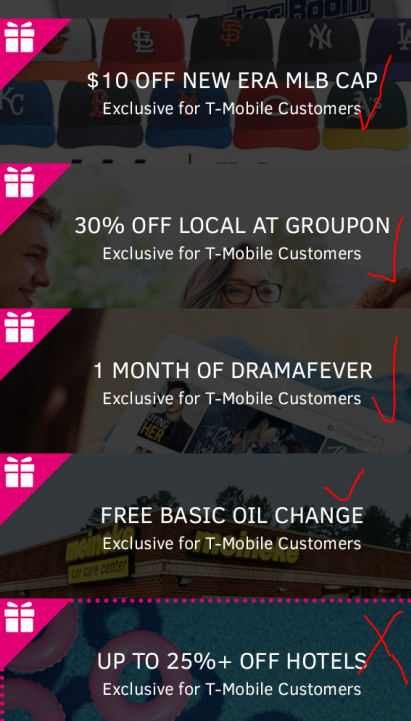 Rejoice T-Mobile users! The August 22, 2017 is a pretty good mix of actual freebies! Four out of the five items are actually good, a pretty good percentage! The freebies for the August 15 (2017) of the T-Mobile Tuesdays have been revealed and there are two brand new freebies coming! You will get a $100 delivery fee service credit at Postmates, and a FREE Sonic CD Steam game. If you are not familiar with Postmates, this $100 credit only covers their service fee. Not the purchase price of products of services. 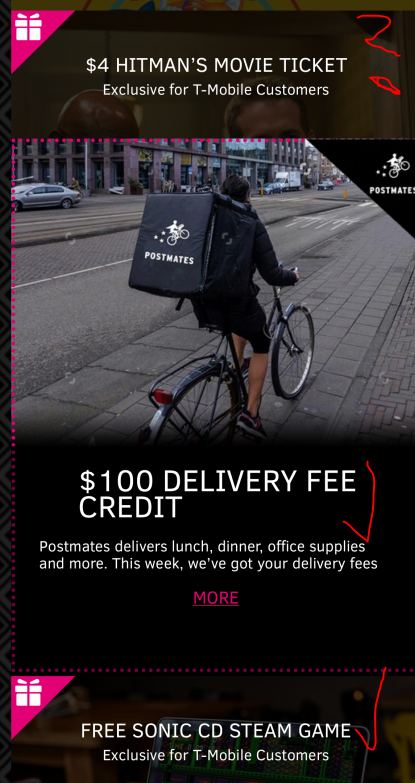 So it’s not $100 to spend at Postmates, but $100 worth in covering the Delivery Fee part of the Postmates bill. The third item is a coupon really, you can watch the new movie Hitman for $4 per ticket. This is a recurring offer that features different new movie theatrical releases.